After six years of seclusion, North Korean leader Kim Jong Un seems to want to get out and see the world. Next is a meeting just south of the Demilitarized Zone with South Korean President Moon Jae-in, then the trickiest meeting of all, with President Donald Trump in an as-yet undisclosed location. He is also rumored to be considering a sit-down with Russia's Vladimir Putin, while one of his staunchest critics, Japanese Prime Minister Shinzo Abe, says he wants some face time, too. Why the sudden penchant for travel? In hindsight, this was the obvious choice for Kim's international debut. China is far and away the North's most important economic partner, and it has tightened its sanctions in recent months to increase the pressure on Kim to ease up with his nuclear weapons program. 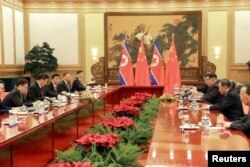 Kim has appeared less willing to toe Beijing's line, however, and relations between the two countries have suffered. North Korean leader Kim Jong Un attends a meeting with Chinese President Xi Jinping in Beijing, as he paid an unofficial visit to China, in this undated photo released by North Korea's Korean Central News Agency (KCNA), March 28, 2018. By suddenly showing up in China on Monday, he completely changed that narrative. It's not known yet what Kim and Xi discussed. Two things are clear. By hosting Kim before anyone else, Xi very effectively reasserted China's primary role in defusing tensions on the Korean Peninsula, which has long been a key national security concern for Beijing. For Kim, meeting with Xi first means he will go into his summits with Moon and Trump better informed and less isolated. More importantly for Kim, the visit could be a step toward persuading China to ease its sanctions, or at least how strictly they are enforced. The announcement that Kim and Moon would meet face to face was the first shocker of the year. Kim floated the idea by sending his invitation-bearing sister to the opening ceremony of the Pyeongchang Olympics last month. The meeting is planned for late April in a truce village inside the DMZ. 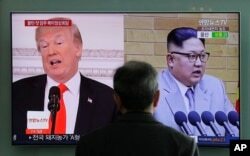 A visitor walks by a TV screen showing file footage of South Korean President Moon Jae-in, left, and North Korean leader Kim Jong Un, right, during a news program at the Seoul Railway Station in Seoul, South Korea, March 29, 2018. Symbolically, it's a huge step forward. 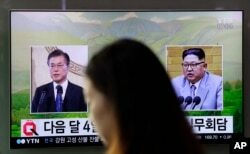 Moon and his liberal government have been taking the initiative to reach out to the North after a year of escalating missile launches and angry rhetorical barrages. Kim extended an olive branch of his own in January, vowing to make improved relations one of his top priorities for the year. Until Kim showed up in Beijing, it appeared Moon would be his first summit partner. While that somewhat blurs the focus on North-South detente, the emotional story line of Korean nationalism and the hope of reunification is still bound to play well with Kim's domestic audience. North Korea is working on several development projects that appear aimed at boosting South Korean tourism to its east coast. Optimistic, yes. But it's worked for Pyongyang before. Kim's father, Kim Jong Il, played that card nicely in the previous inter-Korea summits, held in 2000 and 2007. This one still has a lot of question marks. Basic things, like when and where - and, some might add, if - it will take place have yet to be disclosed. Instead of announcing it themselves, the White House let a visiting delegation from South Korea inform the media that Trump had agreed to Kim's offer to meet "by May." Almost nothing official has been announced since. Trump tweeted Wednesday that he had received a message from Xi saying that Kim "looks forward to his meeting with me." "Now there is a good chance that Kim Jong Un will do what is right for his people and for humanity. Look forward to our meeting!" he tweeted. Lots of potential sites have popped up in the rumor mill, from Trump's Mar-a-Lago resort in Florida to Mongolia (which has good relations with Pyongyang) to an ancient castle in Sweden. In return for the chance to stand shoulder to shoulder as an equal with the leader of the Free World, Kim may release three Americans imprisoned by the North as a gesture of goodwill. But a big question remains over one very important word: "denuclearization." Kim has been using it a lot recently, and some officials in Washington have interpreted that to mean he might be willing to negotiate away his costly and hard-won nuclear arsenal. But another interpretation is that he means a process that would involve all 30,000-plus U.S. troops permanently withdrawing from the South and a slew of security guarantees culminating in a peace treaty to formally end the 1950-53 Korean War. That's what the North has been demanding for decades. A meeting between Kim and Putin would seem to be a no-brainer. Putin has been relatively friendly with Kim's regime and has actively tried to bolster ties, despite the international sanctions. The two countries recently signed an agreement on cooperation in scientific research and might be discussing a new border bridge. Russian media, meanwhile, are speculating that North Korean Foreign Minister Ri Yong Ho is planning to travel to Moscow next month. Better relations with Moscow could benefit Kim tremendously. The fall of the Soviet Union was a major blow to the North - and a contributing factor behind a famine in the 1990s that is believed to have killed at least hundreds of thousands of North Koreans. Ties have never been the same since. But along with potential economic benefits, closer relations with Russia are important as a balance against Chinese influence and buffer against Washington and its allies. Putin is certainly wary of encouraging a nuclear-armed neighbor, cozying up with Kim would be a way of thumbing his nose at the West. And he does seem to like doing that. Mired in a domestic corruption scandal and prone to follow Washington's lead, Prime Minister Shinzo Abe has just recently suggested he, too, wants to get in some quality time with Kim. Japan has big problems with Pyongyang that go well beyond the nuclear issue. Kim Jong Il admitted in a summit in 2002 with then-Prime Minister Junichiro Koizumi that its agents had abducted Japanese citizens in the 1970 and '80s. Several were returned, but Tokyo has since demanded more information and the dispute has become a bitter stalemate. Abe, a North Korea hawk, is worried that Japan's demands on the "abduction issue" will fall to the wayside if he is left out in the cold while Kim meets other leaders. The cost could be excessively high, however. In return for normalized relations, Pyongyang will likely demand that Japan pay more for the damage caused by its 1910-1945 colonization of the Korean Peninsula. Some experts have speculated the bill could run into the billions of dollars.